Malaysian integrated oil and gas services company, Sapura Energy Bhd has received shareholders’ approval for the proposed 50/50 partnership to boost E&P (exploration and production) business with Austria-headquartered oil & gas company, OMV Aktiengesellschaft (OMV AG). According to reports, Sapura Energy said it would receive cash proceeds of RM 7.6 billion from the rights issue and the strategic partnership. 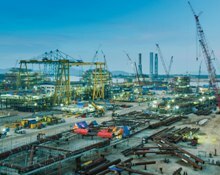 Sapura Energy expects the tieup to enable the sharing of expertise, knowledge and technology that would reduce the risks and capital requirements in exploration and development activities. OMV has annual group revenue of EUR 20 billion and a workforce of more than 20,000 employees. In Upstream, OMV AG has a strong base in Romania, Austria and a balanced international portfolio in the North Sea, the Middle East & Africa and Russia as further core regions.